Adjustable work-support is constructed for heavy-duty use! Adjusts in height from 24-1/2-Inch to 42-1/4-Inch. Unique design provides superior stability. A single, quick folding leg for easy set up and storage. Non-marring wide T-bar base ensures stability. An easy rolling, 13” x 2” galvanized dual ball bearing roller.150 pound capacity. These 5/8" diameter ball bearing rollers are ideal for creating your own out feed roller tables. As the steel balls rotate through 360° they are particularly suited for curved work created on band saws and router tables as well as straight cutting on saw benches and miter saws. There are two screw holes in each bearing surround for positive attachment to the work table. They provide low friction support for most any type of material. 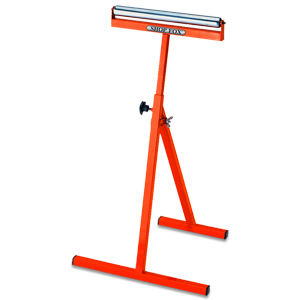 Whether you build a table with rollers on it or a simple roller stand, the rollers on it will provide you with an easy and smooth transition from one platform to the next when traveling across them. 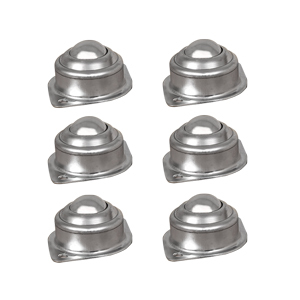 Simply install them by securing each roller ball to your desired mount with the screws that are provided. Add more roller to make more elaborate jigs or fixtures like a finishing table, table saw extension, band saw out feed table and more. The Roller Balls are made from hardened steel and encased in a durable steel housing, each roller has a load rating of 75lbs. These 1" diameter hardened ball bearing rollers are ideal for creating your own out feed roller tables. As the steel balls rotate through 360° they are particularly suited for curved work created on band saws and router tables as well as straight cutting on saw benches and miter saws. There are two screw holes in each bearing surround for positive attachment to the work table. They provide low friction support for most any type of material. Whether you build a table with rollers on it or a simple roller stand, the rollers on it will provide you with an easy and smooth transition from one platform to the next when traveling across them. 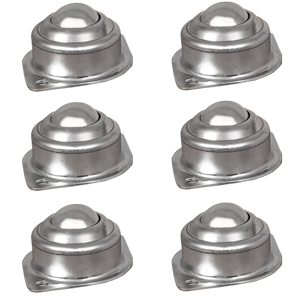 Simply install them by securing each roller ball to your desired mount with the screws that are provided. Add more roller to make more elaborate jigs or fixtures like a finishing table, table saw extension, band saw out feed table and more. The Roller Balls are made from hardened steel and encased in a durable steel housing, each roller has a load rating of 75lbs.